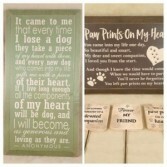 Our Pet items are unique and sure to be treasures in your home or as gifts to another pet lover. Call us today and we will send them out, or deliver them in the River Valley area. 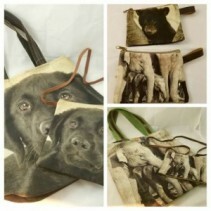 COTTON CANVAS ANIMAL HANDBAGS AND POUCHES - Made in a small village in India of 100% cotton recycled canvas. Good for the earth and good for its creatures. A portion of your purchase is donated to help an endangered species. ------------------------------------------------------------------------------------------------------------- CANVAS POUCH - zip close and leather tabs. Specify either Elephant or Bear. Measures 4.5" x 6". $10.95. -------------------------------------------------------------------------------------------------------------- CANVAS OVER THE SHOULDER BAG - zip close and long leather strap. Specify either Elephant or Black Lab. Measures 6" x 8.5". $16.95. ----------------------------------------------------------------------------------------------------------- CANVAS TOTE BAG - zips closed with canvas and leather straps. Specify either Elephant or Black Lab. Measures 14.5" x 15.25". $48.95. WOOD SIGN - reads "A House Is Not A Home Without A Dog". Measures 7.25" x 18". $24.95. 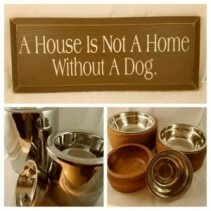 ------------------------------------------------------------------------------------------------------ ANDERSON WOOD DOG BOWLS - The larger ones are great for aging dogs that can not bend down to eat any longer. 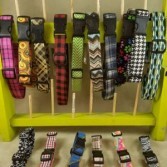 Pamper your dog! Anything but plain, this simple cylindrical collection is made of solid acacia wood, highlighting its natural beauty. Removable Stainless Steel Insert Bowl. Small measures 6.5" dia x 3" high - $32.95. Medium measures 8" dia. x 4" high - $42.95, and Large measures 9.25" dia x 4.25" high - $49.95. 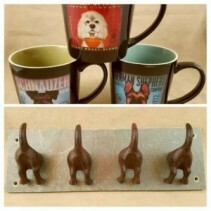 ----------------------------------------------------------------------------------------------------------- HIGH RISE NICKEL DOG BOWLS - Great for aging dogs that can not bend down to eat any longer. Pamper your dog! Design in its purest form, this contemporary porcelain raised feeder features a shiny nickel-plated finish. Removable Stainless Steel Insert Bowl. Medium is 9" diameter x 9"H - $72.95, and Large is 10" diameter x 1"H - $99.95. APAWTHIKARE PET WELLNESS PRODUCTS - an advanced line of pet wellness producTs offers a natural fast-acting solution for restoring healthy skin and happy pets. Developed with the support and expertise of one of the top clinical research communities in the country. This innovative line was designed by nationally recognized trauma and burn surgeon, Dr. Roger Huckfeldt and PhD Biologist, Dr. Phillip Finley who have spent their careers studying the physiology behind skin care and wound healing. Developed to FDA standards using medical research and science. Veterinarian approved. ------------------------------------------------------------------------------------------------------------- SANITIZE+ ANTIBACTERIAL SPRAY - designed to clean and disinfect paws after outdoor activity or a trip to the litter box. This multi-functional spray also works perfectly as a rinse-free bath solution that neutralizes bacteria that cause odor and can lead to skin infections. Kills 99.9% of harmful germs from paws. 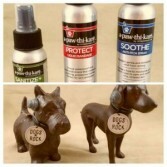 Use on paws or spray on coat to decrease bacteria that cause body odor and skin infections. Contains Aloe Vera to moisturize. 2 fl. oz. $19.00. ------------------------------------------------------------------------------------------------------------ SOOTH ANTI-ITCH SPRAY - developed specifically to give gentle and immediate relief from itchy skin while it moisturizes and calms the irritated area. The non-toxic bittering agent helps naturally deter pets from excessive licking and biting where applied. Relieves itching caused from insect bites, allergies and other skin irritations. Provides gentle and immediate relief from itching. Contains Aloe to moisturize and Witch Hazel to calm and soothe itchy, irritated skin. No-sting formula helps stop wound biting and licking. 4 fl. oz. $19.00. ----------------------------------------------------------------------------------------------------------------- PROTECT LIQUID BANDAGE SPRAY - an easy-to-use alternative to traditional bandages. The unique formula provides a clear breathable barrier that promotes healing of minor wounds and skin irritations while protecting against harmful bacteria and debris in the affected area. Protects scrapes, abrasions, minor cuts and skin irritations to allow rapid healing. Unique waterproof and breathable shield that creates a soothing, protective barrier. Perfect for skin and paws. No-sting alcohol free formula, Quick Drying. 4 fl. oz. $19.00. 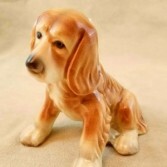 --------------------------------------------------------------------------------------------------------- HEAVY DOG PAPERWEIGHTS/STATUE - Very nicely done, not cheap looking! Select Black Dog or Scottie Dog. Measures 6" x 4.5" high $39.95. 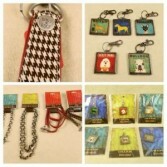 ASSORTED DOG BREED JEWELRY - Really neat jewelry for dog lovers. ------------------------------------------------------------------------------------------------------ TOGGLE BRACELET - adjustable bracelet that you can add charms to (sold separately). 8". $10.95. --------------------------------------------------------------------------------------------------------- TOGGLE NECKLACE - adjustable necklace that you can add charms or pendants to (sold separately). Approximately 22". $12.95. ----------------------------------------------------------------------------------------------------------------- BRAIDED LEATHER WRAP BRACELET OR NECKLACE - add charms or pendants to (sold separately). Specify brick red or platinum. Approximately 20". $12.95 --------------------------------------------------------------------------------------------------------------- BLACK & WHITE HOUNDSTOOTH PURSE FOB - add your keys or charms. Snap close. Approximately 4" long. $12.95. ----------------------------------------------------------------------------------------------------- DOG CHARMS - Specify your breed (we have many) for these cute little charms. Measures 1" x 1". $10.95. ------------------------------------------------------------------------------------------------------ DOG KEYCHAIN (OR CAN BE USED FOR A NECKLACE PENDANT) - Specify your breed (we have many). Measures 2" x 2". $10.95. 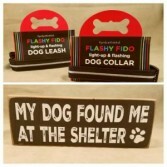 ASSORTED DOG ITEMS WOOD SIGN - reads "My Dog Found Me at the Shelter". Measures 3.5" x 10". $15.95. 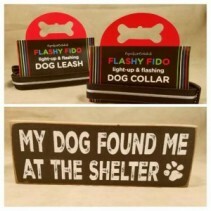 -------------------------------------------------------------------------------------------------------- FLASHY FIDO DOG COLLAR - light-up and flashing with a solid on, fast blink and a slow blink. Great for walks at night with your dog. Visibility in the dark up to 1/4 mile away. Water Resistant, Batteries included. Adjusts from 12" to 20". $24.95. -------------------------------------------------------------------------------------------------------------- FLASHY FIDO DOG LEASH - light-up and flashing with a solid on, fast blink and a slow blink. Great for walks at night with your dog. Visibility in the dark up to 1/4 mile away. Water Resistant, Batteries included. 5' Length. $29.95. ASSORTED DOG MUGS - We have many breeds in stock, so give us a call to see if we have the one you are looking for. Ceramic mug that is microwave and dishwasher safe. Large mug measures 4" diameter and high, and 5.5" with handle. $19.95. --------------------------------------------------------------------------------------------------------------- DOG TAIL HOOK - Use this adorable wagging tail hook for your dog leashes, keys, etc. Iron dog tails mounted on a piece of slate. Measures 3.75" x 12". $29.95. 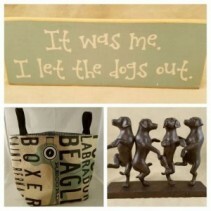 ASSORTED DOG LOVER GIFTS ------------------------------------------------------------------------------------------------------------- DOG WALL SIGN - reads "It was me. I let the dogs out." Wood sign measures 3.5" x 10". $15.95. ------------------------------------------------------------------------------------------------------------- DOG TOTE BAG - The perfect bag to take along to the beach, park or on an overnight that will hold all the dogs things. Heavy 100% cotton canvas with 100% polyester black and white houndstooth lining. Canvas Straps. Measures 11.5" x 15" and 6.5" deep. $41.95. -------------------------------------------------------------------------------------------------------------- DANCING DOGS STATUE - Statue of 4 dancing dogs on pedestal. Heavy Resin, measures 8.5" x 11" long. $49.95. 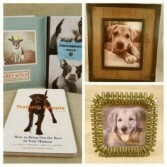 ASSORTED DOG PICTURE FRAMES - perfect for a keepsake picture of your dog. Dazzling crystal trim in a 'dog collar frame' that has a crystal dog bone charm. Specify Baby Pink, Tan, or Ivory. Measures 3.25" diameter. $21.00, boxed. 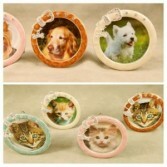 ------------------------------------------------------------------------------------------------------ ASSORTED CAT PICTURE FRAMES - perfect for a keepsake picture of your cat. Dazzling crystal trim in a 'cat collar frame' that has a crystal fish charm. Specify Baby Pink, Tan, Ivory or Aqua Green. Measures 3.25" diameter. $21.00, boxed. ASSORTED DOG BOOKS - We have an intriguing collection of dog books...call us today to see what we have instock. Prices start at about $12.95. 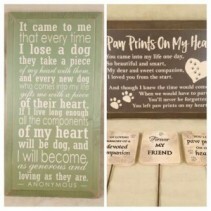 ------------------------------------------------------------------------------------------------------------------ ASSORTED PICTURE FRAMES - We have a nice selection of picture frames that are suitable for a picture of your dog. Call today to see what is instock. ------------------------------------------------------------------------------------------------------------- UPPER RIGHT PHOTO FRAME - measures 14" x 16" and holds an 8 x 10 photo. $89.00. We also have this same frame that holds a 3 x 5 photo. ------------------------------------------------------------------------------------------------------- BOTTOM RIGHT PHOTO FRAME - measures 5.5" square and holds a 4" square photo of a dog or other keepsake photo. A very unique frame with green 'stone' border. $39.95. 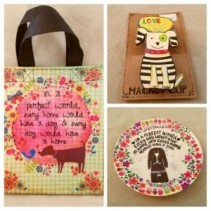 ASSORTED PET SYMPATHY GIFTS - call today to see what is instock now. ------------------------------------------------------------------------------------------------------------------- WOOD SIGN SHOWN ON LEFT - measures 9.25" x 18". $32.95. ------------------------------------------------------------------------------------------------------------- WOOD SIGN SHOWN UPPER RIGHT - measures 9.25" x 12". $26.95. --------------------------------------------------------------------------------------------------------- PET GARDEN STAKES - Put these in your garden, where your pet is buried as a nice tribute to your faithful pet, or in a houseplant. Measures 3.25" square on a 10" stake. Select from "in loving memory of a devoted companion", "forever my friend", or "you left pawprints on our hearts". $7.95.